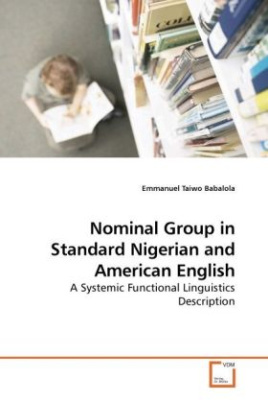 This work was inspired by the need to contribute in giving the necessary direction to the development of Standard Nigerian English comparable to a native standard variety of the language. Accordingly,I have chosen to carry out in the work a comparative analysis of the English nominal group structures and structural types in the essays of selected regular columnists in the internationally well-known English-medium American Time and Newsweek,and Nigerian Tell and Newswatch magazines, so that on the basis of the findings we could discuss the extent to which the emergent Standard Nigerian English could be said to have approximated to theAmerican native standard English variety.The book concludes that since the nominal group is the grammatical area within the sentence where the potentiality for versatile and innovative use of English can be best achieved, standard Nigerian English, in which the nominal group is generally less stylistically exploited and less informative, is clearly yet to attain the same level of syntactic maturity as standard American native English. A robust discussion of the linguistic situation of Nigeria is also offered.